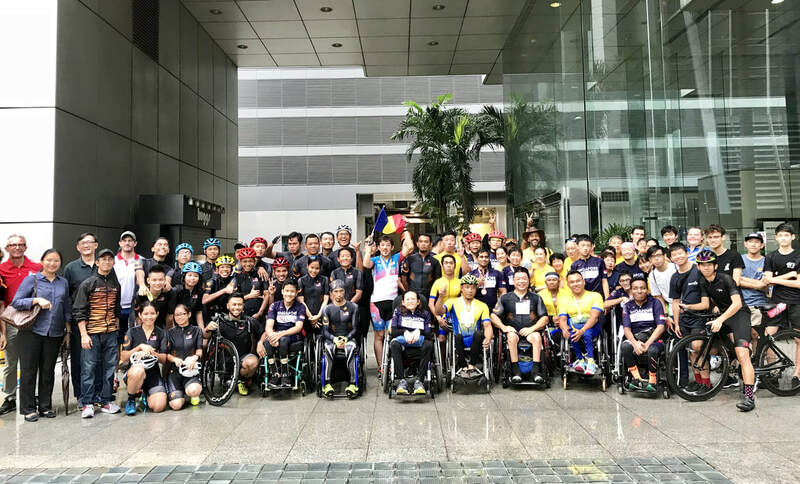 Back in March 2017, only a smattering of competitors from Singapore and Malaysia took part in what was then named the Singapore National Para Cycling Championships, but yesterday’s fully UCI-sanctioned event attracted 41 racers from five different countries, and for the first time on local streets, Tricycling was included on the race program. Tricycling is one of four internationally recognised para-cycling categories and sees its athletes race aboard three-wheeled bicycles. The other three categories are Tandem Cycling, where a visually impaired athlete is paired with a sighted pilot; Hand Cycling, which involves recumbent bikes powered by arms and hands; and Cycling, where road bikes with a variety of modifications to allow the individual riders to turn the wheels and change gears are used. As with all the URA-CFS Share the Road Critériums, the racers were only allocated the 6am-to-7:30am window on the Cecil Street-Robinson Road circuit before the streets needed to be cleared of all racing infrastructure and handed over to the wider Car Free Sunday program. But the experienced race organisers from Cycosports know how to put on a well-oiled show, and together with the Para Cycling Federation of Singapore, they devised a schedule that divided the allotted racing time into two slots, each of which saw two of the para-cycling categories on course concurrently. The Tricyclists and the Hand Cyclists started the action off at 6am sharp. By then the rumbling rains, which had been threatening to spoil the event since the riders began arriving at 5am, had arrived, but nothing bar lightning storms was going to stop the athletes. While the Tricycling event only attracted two racers, that was still two more than last year, and the rousing contest put on by the closely matched protagonists may well have inspired more para-cyclists to consider the three-wheeler option for the future. The win went to Theodor Matican of Romania, who yelled for joy as he crossed the line after outsprinting Abdul Razak Mohd Rizal of Malaysia at the end of their five-lap contest around the 1.7km circuit. Matican’s winning time was 20 minutes, 35.29 seconds. The Hand Cycling contest was the most international event on the race card, with four nations represented. 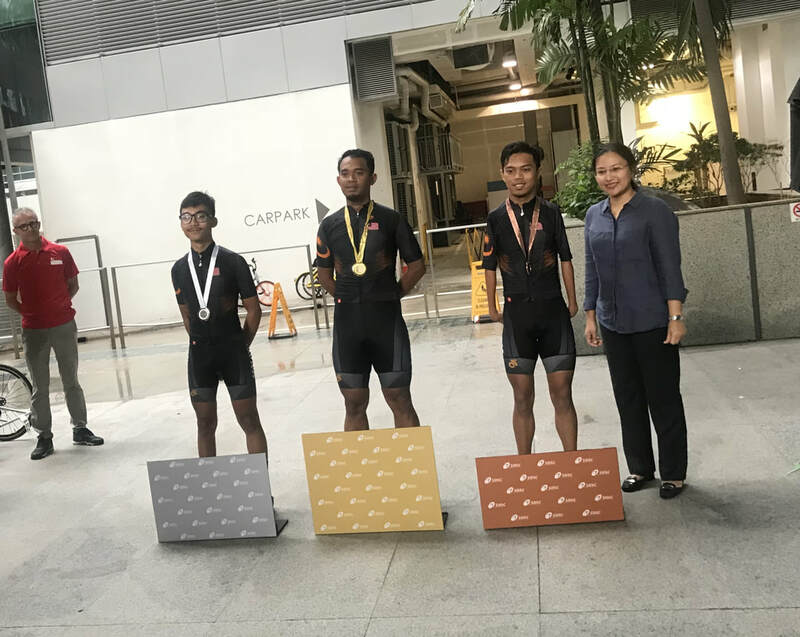 The competitors faced six laps of the CBD course on their recumbent bikes and it was a pair of athletes from Thailand, Comnuan Pooyin and Panalai Sumas, who set the race alight as they fought an exciting duel. It ended with another sprint finish, as Comnuan edged his compatriot by two-tenths of a second to triumph with a split of 19:08.44. Finishing third and joining the two Thai men on the podium was Arkal Prashant of India. The women’s Hand Cycling crown went to Amanda Mok of Singapore. After a short break it was time for the Tandem and Cycling events to take to the start line. The Tandem race saw the biggest jump in participation numbers, with nine pairs compared to just four in 2017. They started first, with the Cyclists rolling off 30 seconds later. The tandem riders faced 12 laps of the course, two more than the Cyclists, a nod to the fact that a bike powered by two people should go faster than one propelled by a single rider. The rain was if anything heavier by time round two of the action kicked off, but the racers didn’t seem to be too affected by the dark, wet roads and potentially slippery corners to negotiate at each end of the circuit. The Tandem race was a fast, exciting affair, with a group of five pairs tightly grouped for the first few laps of the contest. 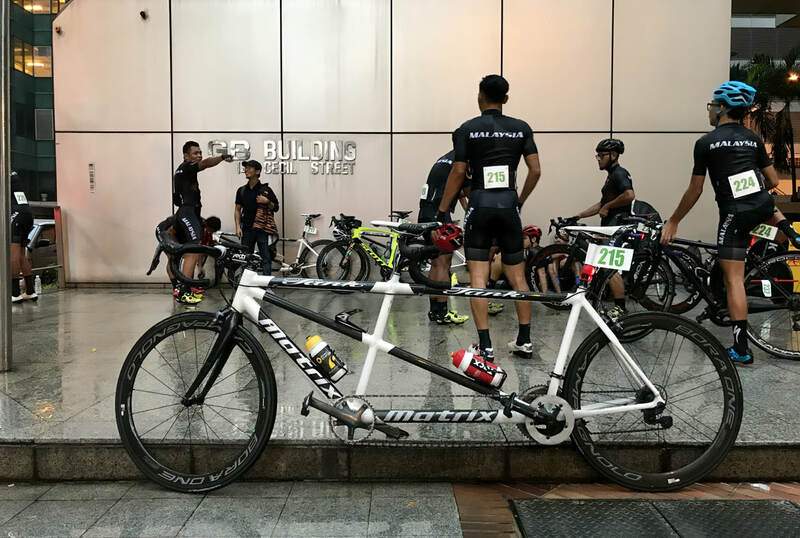 But one Malaysian duo, Aiman Asyraff Ahmad Bajuri and his sighted pilot Mohd Faizal Mohamed Noh, eventually broke free of the pack, and while they never had a huge lead, they drove hard to maintain their advantage all the way to the finish. Their winning time was 31:09.54. Behind, it was another Malaysian pair who led the chase, but Muhammad Khairul Mohd Ali and his pilot Amirol Amirsyam bin Alif couldn’t close the gap and had to settle for the silver medal as they finished some 8 seconds back from the winners. Just a few bikes lengths back, the battle for third over the line was a cracker, and it was won by the fastest female pair, Nur Azlia Syafinaz Mohd Zais and her pilot Nurul Suhada Zainal, both of Malaysia. The women’s champs just held off the third-fastest men’s pair, Wee Leong Tee and his pilot Kee Meng Ang of Singapore. Ang, incidentally is a former Singapore national rider as well as being the current Singapore Cycling Federation Vice-President (Track). Tandem cycling for the visually impaired requires a fully sighted pilot and it’s very helpful for the growth of the discipline in Singapore to have riders of Ang’s quality and stature as part of the program. 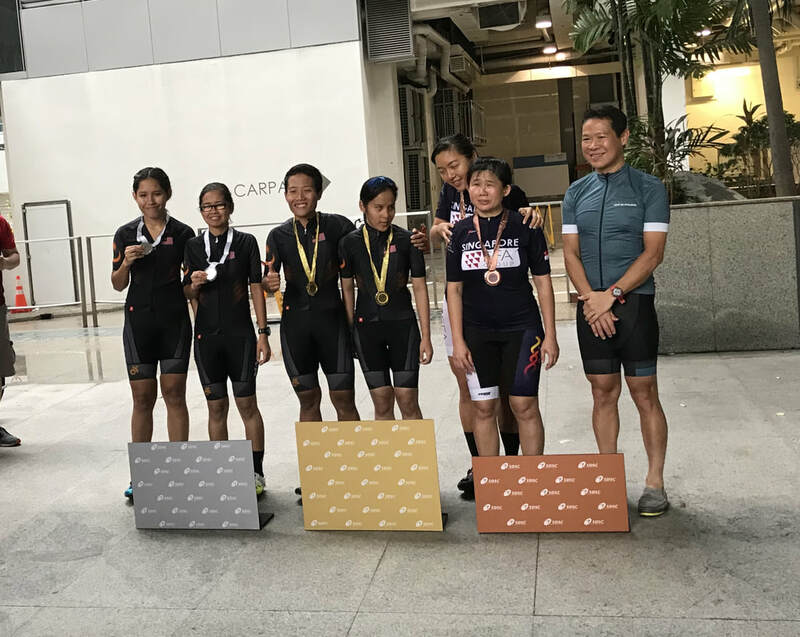 Singapore’s two teams in the women’s tandem race yesterday were also piloted by prominent sighted riders … Sarah Tan and Jeynelle Lee, both current members of Team Singapore’s road racing squad. Tan rode with Emily Lee while Jeynelle Lee accompanied Delia Kang. Those four riders were involved in yet another thrilling battle for the remaining podium places, with both ultimately losing out to the Malaysian pair of Nur Syahida Tajudin and her pilot Noraidillina Adilla J. Sam. All three pairs were separated by less than half a second, with Lee and Tan just edging Kang and Lee off of the podium. Last but not least was the Cycling race. From a distance, especially in the murky pre-dawn light, the fast-moving peloton looked like any other bunch of cyclists, but a closer look revealed riders with withered or missing limbs and a collection of other impairments that make the act of riding a bike a much more challenging task than what most people take for granted, never mind racing! Behind, though, six of his compatriots were involved in a tight race for the podium places. A late attack by Amizazahan Muhammad Adi Raimie saw him claim the runner’s-up spot, a minute behind the winner but 11 seconds clear of the rest. 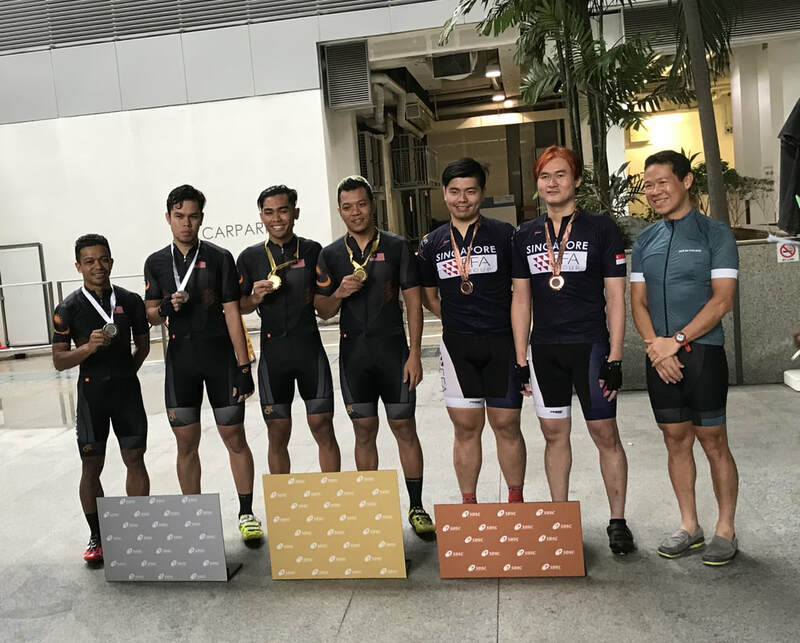 A blanket finish for third place saw five riders separated by 0.27 of a second, with Roshdi Mohamad Syazwan emerging as the winner of that battle to take the final place on the podium. The women’s Cycling winner was Aziz Nur Faizah of Malaysia. The racing finished just as the sun tried to show its face a little after 7am, but the rain persisted and so the post-race celebrations and presentations couldn’t have their traditional URA-CFS crit place under the archway on the start-finish line. Still, like the racing itself, this didn’t dampen affairs, and indeed the cloistered coverings of a Cecil Street skyscraper provided the perfect location for the prize-giving festivities. Let’s hope the Singapore International Para Cycling Cup is back again next year, and let’s hope the Singapore authorities can show more foresight by allowing the racing to take place in daylight during the full Car Free Sunday hours, where the crowds of leisure cyclists, roller-skaters, joggers, etc., that flock to the CBD can witness the inspiring spectacle. 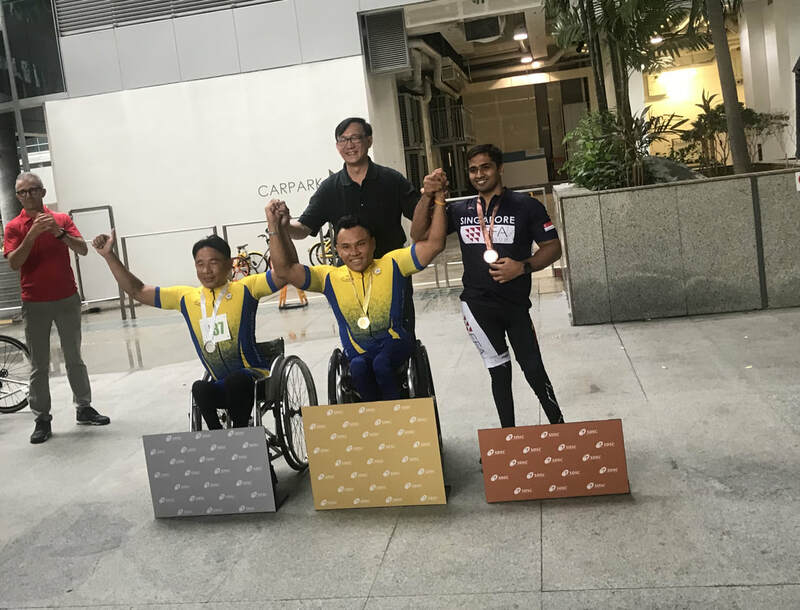 The continual growth in the popularity of para-sports for spectators, especially events such as the Paralympics and the ASEAN Para Games, show that the wider sports-loving community enjoys watching the inspiring para-athletes in action. It should be noted, though, that there are different sub-categories of para-cyclists within each division, most notably in the Hand Cycling and Cycling events. The results described above were the raw, first-past-the-post results, which were used to hand out the prizes yesterday. Full results for the different sub-categories can be found on the official UCI website by clicking on this link.